In a single isolated atom, the electrons in each orbit have definite energy associated with it. But in case of solids all the atoms are close to each other, so the energy levels of outermost orbit electrons are affected by the neighboring atoms. When two single or isolated atoms are bring close to each other then the outermost orbit electrons of two atoms are interact or shared with each other. i.e, the electrons in the outermost orbit of one atom experience a attractive force from the nearest or neighboring atomic nucleus. Due to this the energies of the electrons will not be in same level, the energy levels of electrons are changed to a value which is higher or lower than that of the original energy level of the electron. The electrons in same orbit exhibits different energy levels. The grouping of this different energy levels is called energy band. ● An electron revolving around the nucleus of an atom has potential energy, centrifugal energy, rotational energy and magnetic energy, all of which together determine the total energy or energy level of an electron, this value is measured in unit of electron volt. ● An electron volt can be defined as the amount of energy gained or lost when an electron falls through and moves against potential difference of one volt. ● In other words an electron volt can be defined as the amount of energy required to move one electron through a potential difference of one volt. ● The electrons revolves in outermost orbit has a greater energy than that of electrons revolving in outermost orbit has a greater energy than that of electrons revolving in inner most orbit. If we consider an isolated or individual atom, then all the electrons in a given orbit posses the same energy as shown in figure 4. i.e., if orbit 1 has two electrons, both electrons are at same energy level and so on. ● In practice, only two upper band of energy levelsare considered, because these two bands only having considerable electrical property even there are many hands below valance band. The upper most band is conduction band and the lower one is the valance band these two bands are separated by a gap which is known as forbidden energy gap. ● Vlanace band is a band of energies contains all energy levels available to the valance electrons in the structure. These valance electrons are less attached to individual atoms and are not free to move about as are less attached to individual atoms and are not free to move about as areelectrons in conduction band. ● Conduction band is a band of energies in which the energy level of electrons are high enough so that they are not attached or bound to any atom but are mobile and capable of being influenced by an external force. The electrons in the conduction band are the electrons coming from the valance band that gain sufficient energy through some form of excitetion to jump in to the conduction band. So the electron of Si atom exciting at valance band needs to gains 1.1eV in order to jump the gap and reach the bottom of conduction band. ● Solids are classified in to three types based on energy band theory such as, conductor, semi conductor and insulator. Conductor is a material that easily conduct the current. The best conductor are single element material such as Copper, Silver, Gold and Aluminium. i.e., these atoms have only one valance electrons. 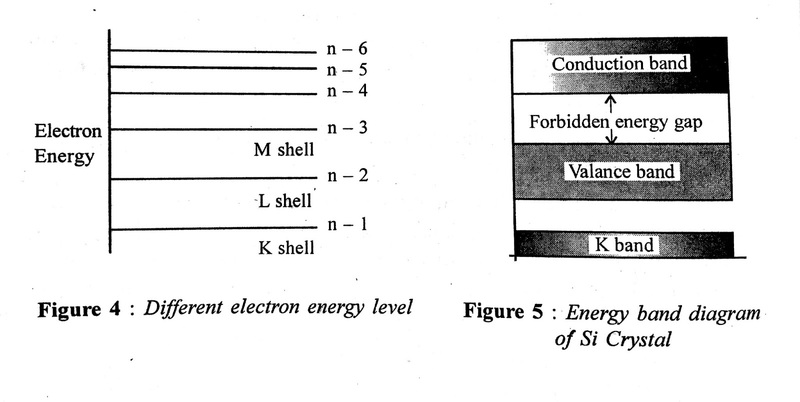 These electrons very loosely bound with nucli, so it can easily break away from their atom and become free electron and forms conduction bands as shown in figure 6(c) i.e., there is no forbidden gap between the conduction and valance band. The resistance of the conductor is very small compared with semiconductor and insulator. The Solids containing metalic bonds are called as metallic solids. 1. It is rigid, nondirectional and crystaline in nature. 3. Low melting and boiling temperature. 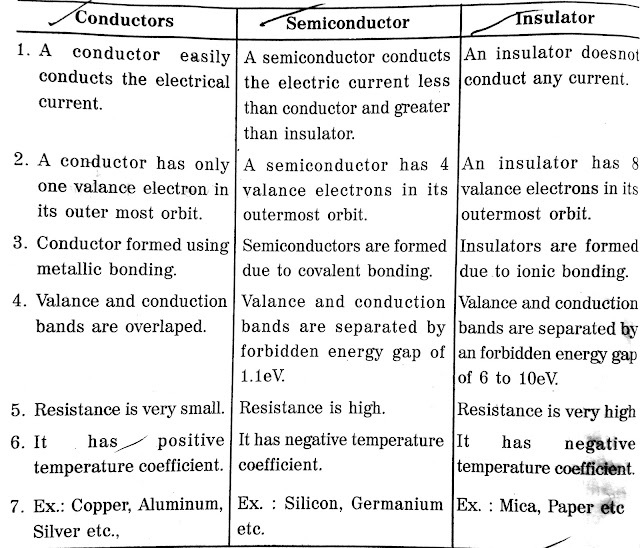 ● A semiconductor material is an element with 4 valance electrons and whose electrical properties lie in between that of insulator and conductors. In terms of energy band, semiconductors can be defined as those materials which have partially filled conduction band and valance band with narrow energy gap seperating the two as shown in figure 6(b). 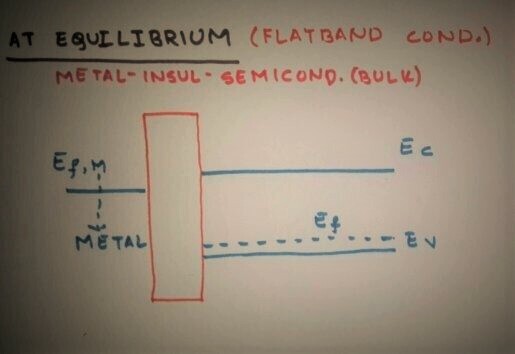 ● At 0K there are no electrons in conduction band and valance band is decreased completely filled, hence it behaves as insulator. ● When increase in temperature, width of forbidden energy band is decreased so that some of electrons are liberated into conduction band thus it behaves as conductor. Semiconductor compounds containing covalent bonds hence these compounds are called covalent compounds. These compounds can exist either in the form of solids or liquids or gases under normal conduction of temperature. 1. It is rigid, directional and crystalline in nature. 2. Coductivity can increased if proper doping material in added. Insulators are those materials in which eight valance electrons and are bound very tightly to parent atoms, thus requiring very large electric field to remove them from attraction of their nucleus. In other words insulators have no free charge carrier availabe with them under normal condition. d) at ordinary temperature the valance electrons of insulators do not have enough energy to jump into the conduction band, therefore insulator does not conduct the current. Thus it have very high resistance at room temperature. If the temperature is raised some of the valance electrons may acquire energy hence it move from one band to other band. This causes the resistivity decreased and it shows that the insulators have negative temperature coefficient. Example: Sodium chloride, Paper, Mica..etc. Ionic bonds hence, it is also called as ionic solids, these solids consists of oppositely charged ions and are tightly bound to one another by the electrostatic of attraction, thus, it requires very high energy to break its bond. 1. It is rigid unidirectional and crystalline in nature. 2. Conductivity is poor in the solid form. 3 It have high melting and boiling temperature.